Hi peeps! How's it going? Vera here today. It's been a while since I posted for Butterfly Reflections and am so happy to be back here today. For your Sunday inspiration, how about some SugarPea Designs cuteness? A moose & a hedgehog roasting marshmallow together....., ah, what a cozy night, right? And sometime when you're feeling all cozy, that's also when you miss someone big time. This happened to me recently, that's why for this image I chose this sentiment (also from the same set). I simply stamp, color and die cut all the images and adhere them with pop-dots. The patterned paper is from Happy Camper paper collection. Hope you like it and also I want to do a quick shout out to Butterfly Reflections Ink for being one of the generous sponsor for Caring Hearts Card Drive. In case you're not familiar with this card drive, I host this card drive annually and this is our 8th year in collecting handmade Christmas/holiday cards for the elderly that lives in nursing homes. We distributed hundreds of card packages to various nursing homes in the U, Canada and Australia. That's an absolutely adorable card ! 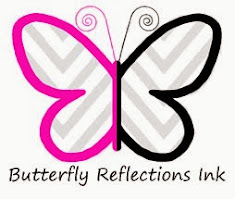 and thanks to The Butterfly Reflections Ink for your generosity.